Another one of DC’s swanky, mega-beef houses. : Bobby Van's interior suggests a men’s club, with dark leather upholstery, and the menu stars filet, porterhouse, sirloin and rib-eye plus selected seafood (Maine lobster, scallops, pepper shrimp and crab cakes). If you drop by for lunch, try the Caesar salad with shaved Parmesan, although the huge ten-ounce hamburger nestled among fries and onion curls is also a draw, plus there is a burger stuffed with blue cheese. The dinner menu features the aforementioned, and very serious, beef and seafood dishes, so take your pick. Check the daily specials before ordering --- the clam chowder is a big success --- and save room for the house-made desserts, including chocolate truffle cake. Be sure to scan the extensive wine list for an interesting pairing. 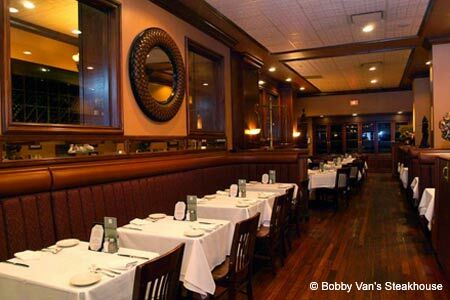 Bobby Van's has a second location on New York Avenue, known as Bobby Van's Grill.